Located in the Waterberg Mountains, Marakele National Park plays host to a wide variety of wildlife. This is due largely to the fact that it encompasses a diversity of habitats in a changing terrain that sweeps from imposing mountains to grassy hills to deep valleys. Elephant, black and White Rhino, various antelope species, Buffalo, Leopard and Cheetah have all made their home here and, in an exciting relocation project, Wild Dog have been introduced with lion and spotted hyena to follow.A splendid variety of birds including more than 800 breeding pairs of the endangered Cape vulture, the flora of the park is equally spectacular with huge yellow-woods, tree ferns, cycads and cedar trees.While parts of the reserve are only accessible by four-wheel drive vehicles, the average sedan will manage the Kwaggasvlakte, the entrance roads and the road to the old military tower, which is in close proximity to the vulture colony and also offers spectacular views of the park. Night drives and hiking trails are soon to be available.There is ample accommodation at a safari-tented camp, bush camp and camping site. There is one wheelchair accessible en suite tent at the tented camp and one accessible ablution block at the camping site. 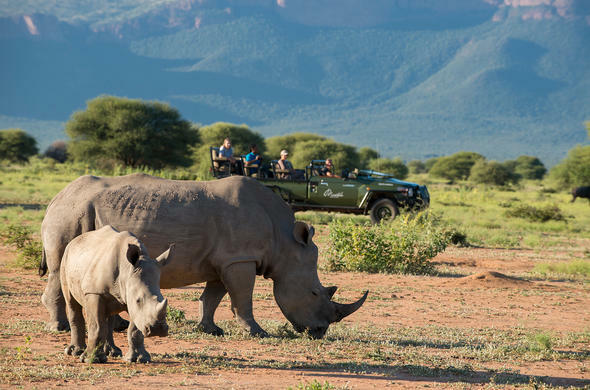 In an effort to conserve the ecosystem as far as possible most tourist facilities are only available outside the park at the nearby town of Thabazimbi. Marakele is a drive of between two and three hours from Gauteng, and about an hour north of Pilanesberg and Sun City.